A gamelan is a kind of musical ensemble of Indonesia typically featuring a variety of instruments such as metallophones, xylophones, drums, and gongs; bamboo flutes, bowed and plucked strings, and vocalists may also be included. The term refers more to the set of instruments than the players of those instruments. A gamelan as a set of instruments is a distinct entity, built and tuned to stay together—instruments from different gamelan are not interchangeable. In Indonesia, gamelan usually accompanies dance, wayang puppet performances, or rituals and ceremonies. Typically, the gamelan players will be familiar with dance moves and poetry, while the dancers are able to play in the ensemble. In the West, gamelan orchestras often perform in a concert setting. The word "gamelan" comes from the Javanese word "gamel," meaning to strike or hammer, and the suffix "an," which makes the root a collective noun. The gamelan predates the Hindu-Buddhist culture that dominated Indonesia in its earliest records, and instead represents a native art form. Gamelan music is built up in layers, with a core melody as the center, known as the balungan, and the various instruments, including the singing in vocal pieces, elaborating upon this melody in specific ways. Except for the sacred songs, gamelan pieces are always changing and new music is always being created. Through trade and emigration, the concept of gamelan music has spread to other Southeast Asian countries, which have developed their own instruments and styles. The gamelan has been appreciated by several western composers of classical music, including Claude Debussy, who heard a Javanese gamelan play at the Paris Exposition of 1889. It has also been incorporated in a number of popular songs and musical scores for film and television. The origins of the gamelan are ancient and mysterious. Apparently gamelan predates the Hindu-Buddhist culture that dominated Indonesia in its earliest records, and instead represents a native art form. The instruments developed into their current form during the Majapahit Empire. In contrast to the heavy Indian influence in other art forms, the only obvious Indian influence in gamelan music is in the Javanese style of singing. In Javanese mythology, the gamelan was created in Saka era 167 (c. 230 C.E.) by Sang Hyang Guru, the god who ruled as king of all Java from a palace on the Maendra mountains in Medangkamulan (now Mount Lawu). He needed a signal to summon the gods, and thus invented the gong. For more complex messages, he invented two other gongs, thus forming the original gamelan set. In the palaces of Java are the oldest known ensembles, the Munggang and Kodokngorek gamelans, apparently from the twelfth century. These formed the basis of a "loud style." A different, "soft style" developed out of the kemanak tradition and is related to the traditions of singing Javanese poetry, in a manner which is often believed to be similar to performance of modern bedhaya dance. In the seventeenth century, these loud and soft styles mixed, and to a large extent the variety of modern gamelan styles of Bali, Java, and Sunda resulted from different ways of mixing these elements. Thus, despite the seeming diversity of styles, many of the same theoretical concepts, instruments, and techniques are shared between the styles. Gamelan music is built up in layers. 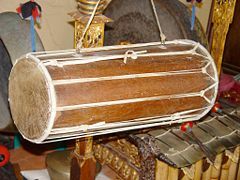 At its center is a basic melody (core melody) known as the balungan. Further layers, including the singing in vocal pieces, elaborate upon this melody in certain ways, but the notes of each layer of music relate to the balungan, and generally coincide at the ends of phrases (called seleh in Javanese). There is also a set of instruments which delineate a colotomic structure, usually ending in the stroke of the largest gong. There is a wide variety of gamelan ensembles, distinguished by their collection of instruments and use of voice, tunings, repertoire, style, and cultural context. In general, no two gamelan ensembles are the same, and those that arose in prestigious courts are often considered to have their own style. Certain styles may also be shared by nearby ensembles, leading to a regional style. The varieties are generally grouped geographically, with the principal division between the styles favored by the Balinese, Javanese, and Sundanese peoples. Balinese gamelan is often associated with the virtuosity and rapid changes of tempo and dynamics of Gamelan gong kebyar, its best-known style. Other popular Balinese styles include Gamelan angklung and kecak, also known as the "monkey chant." Javanese gamelan was largely dominated by the courts of the nineteenth century central Javanese rulers, each with its own style, but overall is known for a slower, more meditative style than that of Bali. Outside of the main core on Java and Bali, where gamelans have spread through migration and cultural interest, new styles sometimes result as well. Malay gamelans are designed in ways that are similar to the Javanese gamelan except that the tune is higher. The gamelans were traditionally played in Riau. Gamelan is also related to the Philippine kulintang ensemble. There is also a wide variety of gamelan in the West, including both traditional and experimental ensembles. Javanese Drums at the Indonesian Embassy in Canberra. Gamelan are found in the Indonesian islands of Java, Madura, Bali, and Lombok (and other Sunda Islands), in a wide variety of ensemble sizes and formations. In Bali and Lombok today, and in Java through the eighteenth century, the term "gong" has been preferred to, or synonymous with, gamelan. Traditions of gamelan-like ensembles (a well known example of which is Kulintang, sometimes called "gong-chime ensembles" by ethnomusicologists) also exist in the Philippines and Suriname, due to emigration, trade, or diplomacy. More recently, through immigration and universal interest, gamelan ensembles have become active throughout Europe, the Americas, Asia, and Australia. Although gamelan ensembles sometimes include solo and choral voices, plucked and/or bowed string and wind instruments, they are most notable for their large number of metal percussion instruments. 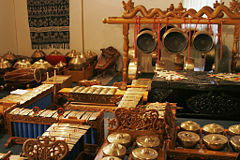 A central Javanese gamelan ensemble includes metallophones, cradled gongs, hanging gongs, xylophone-like instruments called gambang, and drums (kendang). Instruments such as the saron, gendér, gangsa, and ugal are sets of metals bars laid out in a single row and struck like a glockenspiel). The saron typically consists of seven bronze bars placed on top of a resonating frame (rancak). It is usually about 20 cm (8 in) high, and is played on the floor by a seated performer. In a pelog scale, the bars often read 1-2-3-4-5-6-7 across (in kepatihan numbering); for slendro, the bars are 6-1-2-3-5-6-1; this can vary from gamelan to gamelan, or even among instruments in the same gamelan. Slendro instruments commonly have only six keys. It provides the core melody (balungan) in the gamelan orchestra. Sarons typically come in a number of sizes, peking, saron and demung from smallest to largest. Each one of those is pitched an octave below the previous. The slenthem or slentho performs a similar function to the sarons one octave below the demung. The sarons are struck with a mallet (tabuh) in the right hand. Typically the striking mallet is angled to the right to produce a fuller sound. Demung and saron barung generally use a wooden mallet, while the peking mallet is made of a water buffalo horn, which gives it a shriller sound. The left hand, meanwhile, is used to dampen the previous note by grasping the key, in order to prevent a muddy sound. On repeated notes, the note is usually dampened half a beat before it is struck again. A gendér is a metallophone consisting of 10 to 14 tuned metal bars suspended over a tuned resonator of bamboo or metal, which are tapped with a mallet made of wooden disks (Bali) or a padded wooden disk (Java). Each key is a note of a different pitch, often extending a little more than two octaves. There are five notes per octave, so in the seven-note pélog scale, some pitches are left out according to the pathet. Most gamelans include three gendér, one for slendro, one for pelog pathet nem and lima, and one for pelog pathet barang. In some types of gamelan, two gendérs are used, one (called the gendér panerus) an octave higher than the other. In Gamelan Surakarta, the gendér panerus plays a single line of melodic pattern, following a pattern similar to the siter. The gendér barung plays a slower, but more complex melodic pattern that includes more separate right and left hand melodic lines that come together in kempyung (approximately a fifth) and gembyang (octave) intervals. The melodies of the two hands sometimes move in parallel motion, but often play contrapuntally. A gangsa consists of several, tuned metal bars which are hit with a mallet and each make a note of a different pitch. There are different ways of playing the gangsa. In toppaya style, the Kalingas play the flat gongs with their hand and they are in a sitting position. In gangsa pattung, the gangsas are played with padded sticks. In this manner, the players are standing slightly bending forward in step with the dancers. The bonang is a collection of small gongs (sometimes called "kettles" or "pots") placed horizontally onto strings in a wooden frame (rancak), either one or two rows wide. All of the kettles have a central boss, but around it the lower-pitched ones have a flattened head, while the higher ones have an arched one. Each is tuned to a specific pitch in the appropriate scale; thus there are different bonang for pelog and slendro. They are typically hit with padded sticks (tabuh). This is similar to the other cradled gongs in the gamelan, the kethuk, kempyang, and kenong. Bonang may be made of forged bronze, welded and cold-hammered iron, or a combination of metals. In addition to the gong-shaped form of kettles, economical bonang made of hammered iron or brass plates with raised bosses are often found in village gamelan, in Suriname-style gamelan, and in some American gamelan. Bonang panerus is the highest of them, and uses the smallest kettles. It generally covers two octaves (sometimes more in slendro on Solonese-style instruments), covering approximately the same range as the saron and peking combined. It plays the fastest rhythms of the bonang, wither interlocking with or playing at twice the speed of the bonang barung. Bonang barung is pitched one octave below the bonang panerus, and also generally covers two octaves, approximately the same range as the demung and saron combined. This is one of the most important instruments in the ensemble, as it gives many of the cues to other players in the gamelan. Bonang panembung is pitched the lowest. It is more common in Yoyganese style gamelan, covering approximately the same range as the slenthem and demung combine. 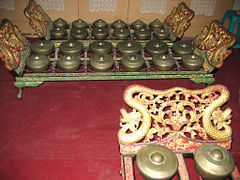 When present in Solonese-style gamelan, may have only has one row of six (slendro) or seven kettles sounding in the same register as the slenthem. It is reserved for the most austere repertoire, typically playing a paraphrase of the balungan. 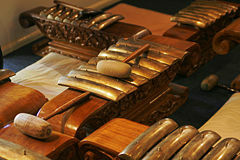 The parts played by the bonang barung and bonang panerus are more complex than many instruments in the gamelan; thus, it is generally considered an elaborating instrument. Sometimes it plays melodies based on the balungan, though generally modified in a simple way. However, it can also play more complex patterns, obtained by combining barung and panerus patters, such as the alternation of interlocking parts (imbal) and the interpolation of florid melodic patterns (sekaran). A single, l-shaped, row, bonang is also a leading melodic instrument in the Sundanese Gamelan degung. The kenong is also a cradled gong, placed on its side and is roughly as tall as it is wide. Kenongs are generally much larger than the bonang, kempyang and ketuk. Its pitch is rather high considering its size; its sound stands out because of its unique timbre. Kenongs are usually played with similar padded sticks to the bonang, except larger. 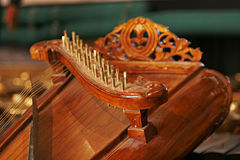 The kenong is sometimes played by the same player as the kempyang and ketuk. The kenong usually has a specific part in the colotomic structure of the gamelan, marking off parts of a structure smaller than a gongan (the space between each strike of the gong). The contents of each part between strikes of a kenong is called a nongan. In a fast, short structure these can only last a second or so; in a longer gendhing, particularly in a slow irama, they can last several minutes. There are usually two or four nongans in a gongan. Kenongs are usually in sets of one for each note, although sometimes other notes can be substituted for any missing notes. A full gamelan would include sets for slendro and pelog. The boxes (rancak) for the kenong are usually for one or two; these are then put in a line or curve surrounding the player. There are generally more of them than there are kempuls, as all gamelan structures require kenong but not necessarily kempul. 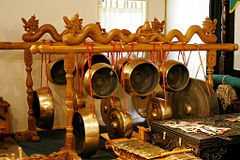 A kempul is a type of hanging gong used in Indonesian gamelan. It is often placed with the gong suwukan and gong ageng, hanging on a single rack, at the back of the gamelan, and these instruments are often played by the same player with the same mallets. There are usually several kempul in each pélog and sléndro; however, there are frequently some notes missing and thus they have to share a kempul (usually at a related interval, like a fifth). The appropriate kempul depends on the balungan, the pathet (mode), and other considerations. The kempul in Javanese gamelan has a colotomic function, similar to the kenong. In the longest structure, gendhing, no kempul is used. In shorter structures, such as ketawang, the kempul is used to divide the nongans (kenong strokes). In the shortest, wayang structures, the kenong plays on every other kenong hit. 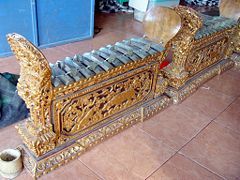 The similar instrument in Sundanese gamelan is the jengglong and in the Maguindanao kulintang is the gandingan. Kempur is the Balinese name for the gong suwukan. The gong ageng (Kromo Javanese meaning large gong, ngoko is gong gedhe) is the largest gong in a Javanese and Balinese gamelan. It is used as to mark the largest phrases in the structure. In small structures, the gong ageng is used to mark larger groups than the smaller gong suwukan. In the larger gendhing, only the gong ageng is used. It is typically pitched to match the 6 of the gamelan. Full gamelans sometimes only have one, for both pélog and sléndro, but can have both as well, even if the pitches are the same. The gong suwukan is the smaller gong in the set used for smaller phrases. It is generally pitched higher, and at different pitches for pélog and sléndro. Frequently gamelans will have more than one gong suwukan, for different ending notes, and different pathet. Most common is a 1 for pathet sanga and lima, and two for pélog pathet nem and barang, and sléndro pathet nem and manyura. Usually a 1 can be played for gatra ending in 1 or 5, and a 2 for 2 or 6. A few gamelans include a gong suwukan 3 as well. A gongan is the time between soundings of the gong which can vary from a few seconds to several minutes depending on the tempo, irama, and length of the structure (bentuk). It is the longest time-span in the colotomic structure of gamelan. The goong ageung plays a similar role in Sundanese gamelan (e.g. degung). 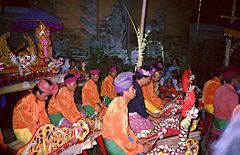 The kempur in Balinese gamelan is similar to the gong suwukan (and not to be confused with the Javanese kempul). In other Indonesian and Philippine cultures, its analog is the agung. The gong ageng is considered the most important instrument in a gamelan ensemble, and the soul or spirit of the gamelan is said to live in it. They are sometimes given offerings of flowers and incense before performances. 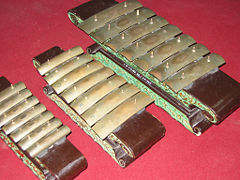 “Gambang” are xylophone-like instruments similar to saron and gendér but with wooden bars instead of metal ones. The bars of the instrument are made of a dense wood, generally teak or ironwood (kayu besi), and are mounted in a deep wooden case that serves as a resonator. Instruments typically have 17-21 keys that are easily removed, and are kept in place by having a hole through which a nail is placed. Generally a full gamelan has two sets, one gamabang pelog and the other one gambang slendro. A pair of long thin mallets (tabuh), made of flexible water buffalo horn tipped with felt, are used to play the instrument. Gambangs are generally played in parallel octaves (gembyang). Occasionally, other styles of playing are employed such as playing kempyung which are playing two notes separated by two keys. Unlike most other gamelan instruments, no dampening is required, as the wood does not ring like the metal keys of other instruments. The gambang is used in a number of gamelan ensembles. It is most notable in the Balinese gamelan Gambang. In Javanese wayang, it is used by itself to accompany the dalang in certain chants. Within a full gamelan, it stands out somewhat because of the high speed of playing, and contrasting timbre because of its materials and more because it has widest melodic range which the other instruments don't have. In Javanese gamelan, the gambang plays cengkok like the other elaborating instruments. However, the repertoire of cengkok for the gambang is more rudimentary than for other instruments (for instance, the gendér), and a great deal of variation is accepted. 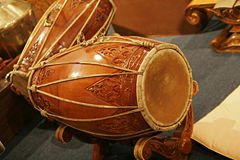 Kendang (Javanese: Kendhang) is the primary drum used in the Gamelan ensembles of Java and Bali as well as various Kulintang ensembles in Indonesia, Malaysia, Brunei and the southern Philippines. They usually are placed on stands horizontally and hit with the hands one either side while seated on the floor. One side is generally larger than the other, with the larger, lower-pitched side usually placed to the right. The skin is typically made of goat or buffalo, stretched on y-shaped leather or rattan strings, which can be tightened to change the pitch of the heads. The kendhang is smaller than the bedug, which is placed inside a frame, hit with a beater, and used less frequently. In archaic gamelan ensembles, the kendang may be hit with a stick. Kendhang ageng, kendhang gede (krama/ngoko, similar to gong ageng in usage), or kendhang gendhing is the largest kendhang, which usually has the deepest tone. It is played by itself in the kendhang satunggal (lit. "one drum") style, which is used for the most solemn or majestic pieces or parts of pieces. It is played with the kendhang ketipung for kendhang kalih (lit. "two drum") style, which is used in faster tempos and less solemn pieces. Kendhang ciblon is a medium-sized drum, used for the most complex or lively rhythms. It is typically used for livelier sections within a piece. The word ciblon derives from a Javanese type of water-play, where people smack the water with different hand shapes to give different sounds and complex rhythms. The technique of this kendhang, which is said to imitate the water-play, is more difficult to learn than the other kendhang styles. Kendhang batangan or kendhang wayang is also medium-sized, and was traditionally used to accompany wayang performances, although now other drums can be used as well. Kendhang ketipung is the smallest kendhang, used with the kendhang ageng in kendhang kalih style. The kendang usually has the function of keeping the tempo and changing irama, and signalling some of the transitions (paralihan) to sections and the end of the piece (suwuk). In dance or wayang, the kendhang player must follow the movements of the dancer, and communicate them to the other players in the ensemble. In Indonesia, gamelan usually accompanies dance, wayang puppet performances, or rituals and ceremonies. Typically, players in the gamelan will be familiar with dance moves and poetry, while dancers are able to play in the ensemble. In wayang, the dalang (puppeteer) must have a thorough knowledge of gamelan, as he gives the cues for the music. Gamelan can be performed by itself - in "klenengan" style, or for radio broadcasts - but concerts in the Western style are not traditional. Gamelan's role in rituals is so important that there is a Javanese saying that, "It's not official until the gong is hung." Some performances are associated with royalty, such as visits by the sultan of Yogyakarta. Certain gamelans are associated with specific rituals, such as the Gamelan Sekaten, which is used in celebration of Mawlid an-Nabi (Muhammad's birthday). In Bali, almost all religious rituals include gamelan performance. Gamelan is also used in the ceremonies of the Catholic church in Indonesia. Certain pieces are designated for starting and ending performances or ceremonies. When a "leaving" piece (such as Udan Mas) is begun, the audience will know that the event is nearly finished and will begin to leave. Certain pieces are also believed to possess magic powers, and can be used to ward off evil spirits. In the court tradition of central Java, gamelan is often played in the pendopo, an open pavilion with a cavernous, double-pitched roof, no side walls, and a hard marble or tile floor. The instruments are placed on a platform to one side, which allows the sound to reverberate in the roof space and enhances the acoustics. The sekaha is led by a single instructor whose job in the community is to direct the group and to compose new songs. When they are working on a new song, the instructor will lead the group in practice and help the group form the new piece of music as they are practicing. When the instructor creates a new song, he leaves places open for interpretation so that the group can improvise; as a group they will be writing the music as they are practicing it. A single new piece of music can take several months to complete. Balinese Gamelan groups are constantly changing their music by taking familiar pieces and mixing them together, or trying new variations on their music. They believe that music by its very nature should grow and change; the only exception is the most sacred songs which are never changed. The tuning and construction of a gamelan orchestra is a complex process. Javanese gamelans use two tuning systems: sléndro and pélog. There are other tuning systems such as degung (exclusive to Sunda, or West Java), and madenda (also known as diatonis, similar to a European natural minor scale). In central Javanese gamelan, sléndro is a system with five notes to the diapason (octave), fairly evenly spaced, while pélog has seven notes to the octave, with uneven intervals, usually played in five note subsets of the seven-tone collection. This results in sound quite different from music played in a western tuning system. Many gamelan orchestras will include instruments in each of the tunings, but each individual instrument will only be able to play notes in one tuning. The precise tuning used differs from ensemble to ensemble, and gives each ensemble its own particular flavor. The intervals between notes in a scale are very close to identical for the different instruments within a gamelan, but the intervals vary from one gamelan to the next. Colin McPhee, author of Music in Bali has remarked, "Deviations in what is considered the same scale are so large that one might with reason state that there are as many scales as there are gamelans." However, this view is contested by some teachers of gamelan, and there have been efforts to combine multiple ensembles and tuning structures into one gamelan to ease transportation at festival time. One such ensemble is gamelan Manikasanti, which can play the repertoire of many different ensembles. Balinese gamelan instruments are commonly played in pairs which are tuned slightly apart to produce interference beats, ideally at a consistent speed for all pairs of notes in all registers. It is thought that this contributes to the very "busy" and "shimmering" sound of gamelan ensembles. In the religious ceremonies that contain gamelan, these interference beats are meant to give the listener a feeling of a god's presence or a stepping stone to a meditative state. Traditionally gamelan music is not notated, and began as an oral tradition. However, in the nineteenth century the kratons of Yogyakarta and Surakarta developed distinct notations for transcribing the reportoire. These were not used to instruct the musicians, who had memorized the pieces, but to preserve pieces in the court records. The Yogyanese notation is a checkerboard notation, which uses six vertical lines to represent notes of higher pitch in the balungan (core melody), and horizontal lines which represent the series of beats, read downward with time. The fourth vertical line and every fourth horizontal line (completing a gatra) are darkened for legibility. Symbols on the left indicate the colotomic structure of gongs and so forth, while specific drum features are notated in symbols to the right. The Solonese notation reads horizontally, like Western notation, but does not use barlines. Instead, note values and rests are squiggled between the notes. Today this notation is relatively rare, and has been replaced by kepatihan notation, which is a cipher system. Kepatihan notation developed around 1900 at the kepatihan in Surakarta. The pitches are numbered (see the articles on the scales slendro and pélog for an explanation), and are read across with dots and lines indicating the register and time values. Like the palace notations, however, they record only the balungan part, and to a large extent what the audience hears relies on the memorized patterns which the performers call upon during performance. However, teachers have also devised certain notations, generally using kepatihan principles, for the cengkok (melodic patterns) of each elaborating instrument. In ethnomusicological studies, transcriptions are often made onto a Western staff, sometimes with unusual clefs. The gamelan has been appreciated by several western composers of classical music, most famously Claude Debussy, who heard a Javanese gamelan play at the Paris Exposition of 1889 (World's Fair). (The gamelan Debussy heard was in the slendro scale and was played by Central Javanese musicians.) Despite his enthusiasm, direct citations of gamelan scales, melodies, rhythms, or ensemble textures have not been located in any of Debussy's own compositions. However, the equal-tempered whole tone scale appears in his music of this time and afterward, and a Javanese gamelan-like heterophonic texture is emulated on occasion, particularly in "Pagodes," from Estampes (solo piano, 1903), in which the great gong's cyclic punctuation is symbolized by a prominent perfect fifth. Direct homages to gamelan music are to be found in works for western instruments by Béla Bartók, Francis Poulenc, Olivier Messiaen, Colin McPhee, Benjamin Britten, Pat Metheny, and Steve Reich. In more recent times, American composers such as Barbara Benary, Philip Glass, Lou Harrison, Dennis Murphy, Loren Nerell, Michael Tenzer, Evan Ziporyn, Daniel James Wolf and Jody Diamond as well as Australian composers such as Peter Sculthorpe, Andrew Schultz and Ross Edwards have written several works with parts for gamelan instruments or full gamelan ensembles. I Nyoman Windha is among contemporary Indonesian composers who have written compositions using western instruments along with gamelan. American folk guitarist John Fahey included elements of gamelan in many of his late-1960s sound collages, and again in his 1997 collaboration with Cul de Sac, The Epiphany of Glenn Jones. Experimental pop groups The Residents, Mouse on Mars, His Name Is Alive, Xiu Xiu, Macha and the Sun City Girls have used gamelan percussion. The gamelan has also been used by British multi-instrumentalist Mike Oldfield at least three times, "Woodhenge" (1979), "The Wind Chimes (Part II)" (1987) and "Nightshade" (2005). Recently, many Americans were introduced to the sounds of gamelan by the popular anime film Akira. Gamelan elements are used in this film to punctuate several exciting fight scenes, as well as to symbolize the emerging psychic powers of the tragic hero, Tetsuo. The gamelan in the film's score was performed by the members of the Japanese musical collective Geinoh Yamashirogumi. Gamelan and kecak are also used in the soundtrack to the video game Secret of Mana. ↑ The Embassy of the Republic of Indonesia, Bulletin for National Museum of Canada (Ottawa: April 1961), 2, cited in Donald A. Lentz. The Gamelan Music of Java and Bali: An Artistic Anomaly Complementary to Primary Tonal Theoretical Systems. (Lincoln: University of Nebraska Press, 1965), 5. ↑ R.T. Warsodiningrat, Serat Weda Pradangga. Cited in A. R. Roth. New Compositions for Javanese Gamelan. (University of Durham, Doctoral Thesis, 1986), 4. ↑ Simon Broughton, et al., (eds.) World Music: The Rough Guide. (London: The Rough Guides, 1994), 418. ↑ 7.0 7.1 7.2 Broughton, 420. ↑ Jennifer Lindsay. Javanese Gamelan. (Oxford: Oxford University Press, 1979. ISBN 0195804139), 45. ↑ 9.0 9.1 Broughton, 421. ↑ Colin McPhee, Music in Bali (New Haven, CT: Yale University Press, 1966). ↑ Neil Sorrell, A Guide to the Gamelan (London, UK: Faber and Faber, 2000). ↑ Sorrell, 2000, 2-7, discusses the incident, about which much remains uncertain. In particular, it is unknown whether they played the Cirebonese instruments that the Paris Conservatoire received in 1887, which would be substantially different from their ordinary set, or if they brought their own set. ↑ Although the five notes of the slendro set are closest in pitch to a pentatonic scale, this scale would have been familiar from other folk sources, as it is a common scale worldwide. It is the equally tempered whole-tone scale that is more analogous of the exotic slendro scale. Tenzer, Michael. Balinese Music. Seattle, WA: University of Washington, 1991. ISBN 0945971303. Included is an excellent sampler CD of Balinese Music. Kunst, Jaap. Music in Java: History Its Theory and Its Technique. The Hague: Nijhoff, 1949. ISBN 9024715199. An appendix of this book includes some statistical data on intervals in scales used by gamelans. Roth, A.R. New Compositions for Javanese Gamelan. University of Durham, Doctoral Thesis, 1986. Langen Suka - Javanese gamelan. Gongcast - Webcast of gamelan recordings. A collection of recent recordings of Central Javanese gamelan with extensive musical excerpts. This page was last modified on 29 May 2017, at 22:23.